Ceﬁxime is a signiﬁcant member of orally active third generation cephalosporin and has excellent activity against many pathogens. The virtual bioavailability of a newly industrial dispersible tablet as compared with a recognized identified formulation. An open-label, single-dose, randomized, 2-way crossover study was conducted in fasted healthy Iranian male volunteers. Eligible participants were randomly assign in a 1:1 ratio to be given one tablet(400 mg) of the test or reference formulation, followed by a 2-week washout period and administration of the exchange formulation. The study drugs were administered after a 10-hour overnight fast. A simple and available reversed-phase HPLC method with UV detection has been urbanized and validate for cefixime evaluate in human plasma using a C18analytical column and a mobile phase of tetrabutylammonium hydroxide (pH=6.5)-acetonitril (3:1 v/v). The detection wavelength was 280 nm. The cefixime serum concentration time curves were used to find pharmacokinetic parameters counting AUC0–24, AUC0–∞, and Cmax. To method observed major linear response-concentration association all through the cefixime concentration range of 15-100 ng/ml, with the average accuracy within-run and between-run values of 97.29 and 99.27 percent. The average drug recovery from plasma was 98.2 percent throughout the linear concentration range. The limits of detection (LOD) and quantitation (LOQ) of the method were 5 and 15ng/ml, respectively. The mean (SD) Cmax, Tmax, AUC0–24 and AUC0–∞ values after administration of the test and reference formulations, respectively, were in this manner: 4.68 (0.97) versus 4.72 (0.67) µg/mL, 4.28(0.86) versus 4.25 (0.73) hours, 43.37 (1.13) versus 43.39(1.22) µg/mL/h, and 60.17 (1.98) versus 59.96 (2.13) µg/mL/h. The mean (SD) t1/2 was 5.32 (2.01) hours for the test formulation and 5.34 (2.13) hours for the reference formulation. No statistical differences were showed for Cmax and the area under the plasma concentration-time curve for test and reference tablets. The calculated 90 % confidence intervals based on the ANOVA analysis for the mean test/reference ratios of Cmax, AUC0–∞ and AUC0–24 h of cefixime were in the bioequivalence range (97 %–119 %). 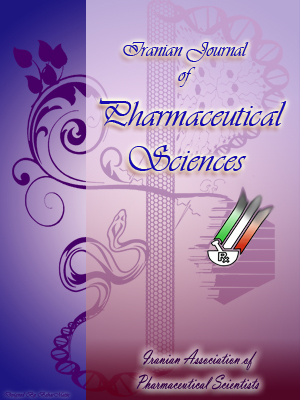 The method is quick, easy, very steady and precise for the partition, assignment, pharmacokinetic and bioavailability evaluation of ceﬁxime healthy Iranian adult male volunteers.